The romance, beauty, peace, and hospitality of early California are yours for the asking---just three hours and a century away from San Francisco in the snug and cozy cottages of the Griffin House at Greenwood Cove in the village of Elk (population 250). Located on the Mendocino Coast and built around 1890, the main house (now Bridget Dolan's Pub and Dinner House) and 1920's cottages are nestled high on the cliffs overlooking the blue Pacific Ocean. 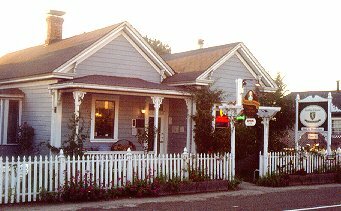 Each of the eight cottages at the Griffin House is individually and uniquely decorated and furnished to provide a romantic, cozy and comfortable place for you to stay. All have private baths and wood-burning stoves. Four of the cottages overlook the ocean and Greenwood Cove and have very private view decks, while the rest are tucked in among lush, informal gardens. A hearty breakfast is served daily on a tray delivered right to your cottage door. Although somewhat seasonal, the Pub is generally open daily from 3pm- 10pm for "pub grub", drinks, dinner and lively conversation with local folks and other travelers.